As mentioned above, many receptors during transduction are linked with G proteins, which are regulated by the binding of guanine nucleotides. This class includes receptors for muscarine, serotonin, histamine, norepinephrine and epinephrine, adenosine, dopamine, GABA, opioid and neurokinins [34-35-36]. When an agonist binds to receptors of this family, the conformation of the receptor changes, and the intracellular domain of the receptor interacts with G protein. The bound G protein undergoes changes which regulate the activity of enzymes or ion channels. The enzymes, as a result of their interaction with G proteins, can increase or decrease the formation of intracellular second messengers which can initiate a chain of events including phosphorylation reactions, which ultimately result in a biological response. G proteins may be further linked with ion channels, which as a result of phosphorylation reactions, can alter the movement of ions into or out of the cell. 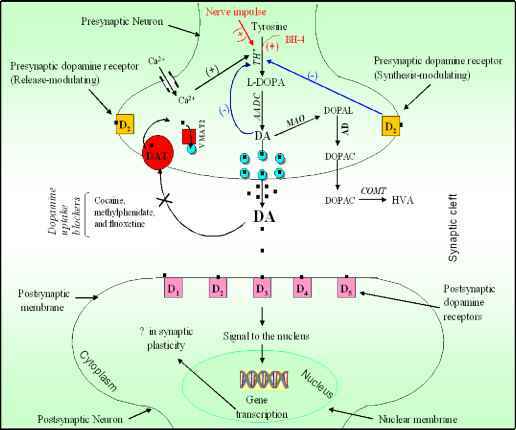 Much of the information about these receptors is derived from studies of p2-adrenoceptors and rhodopsin, the photosensitive molecule of the rod-cells found in the retina [37,38]. The photoreceptor molecule, rhodopsin, consists of a protein, opsin, which contains seven transmembrane units, and 11-cis-retinal, a chromophore that is bound to the lysine residue of the receptor located within the membrane. Light is absorbed by the 11-cis-retinal group, which undergoes isomerization to all-trans-retinal, producing a change in the conformation of rhodopsin. This change activates a G protein called transducin. This receptor activated cascade further activates the enzyme, phosphodiesterase, which hydrolyzes 3',5' cyclic GMP. The resultant decrease in cyclic GMP levels causes the closing of sodium channels, which is the electrical signal that hyperpolarizes retinal cells. Thus, this light-transducing receptor is a G protein that resembles receptors that respond to certain neurotransmitters, hormones, and drugs. The general molecular architecture of rhodopsin resembles that of the p2-adrenoceptor, which is coupled to G proteins [35,39]. Several G protein-linked receptors consist of a single polypeptide chain, with seven hydrophobic membrane spanning domains of between 20 to 28 amino acids; each of the domains are arranged in an a-helix. The carboxyl terminal of the receptor protein is located on the cytoplasmic side of the membrane, while the amino terminal is located extracellularly. There are three connecting loops on the cytosolic side of the membrane; the third loop contains the largest number of amino acids and interacts with the G protein. The identity of the ligand-interacting groups on the receptor protein is being actively investigated. It is thought that the transmembrane spanning segments of the receptor form a central pocket within the membrane, and ligands for these receptors bind to certain specific amino acids within this formed pocket. For biogenic amines, the side chain amine group is thought to bind to the receptor in the protonated form. Site-directed mutagenesis studies on the interactions of ligands with cloned receptors that do not contain specific amino acids suggest that the positively charged group may interact with the carboxyl group of an aspartate113 residue , in the third hydrophobic domain (Figure 2). This amino acid residue is conserved in all G protein receptors that bind to biogenic amines. It is also thought that the catechol groups of ligands interact with serine residues at positions 204 and 207 in the fifth membrane spanning domain of the receptor. Site-directed mutagenesis studies of the P-receptor have also provided evidence that the phenylalanine at position 290 of the sixth membrane spanning unit is important for ligand binding. Patil et al  used bovine rhodopsin crystal structure as a model to elucidate the agonist interacting amino acid residues for aiA and Pi- adrenoreceptors. It was observed that both -+NH3 and chiral-OH group of (-)-epinephrine interacted with Asp 106 transmembrane domain III of a1A adrenoreceptor. Similar interaction of the agonist was observed at p1- adrenoreceptor. Some differences, particularly the interaction of catechol group with serine residues of domain V of two adrenoreceptors were observed. Refer to figure 2. The aromatic group of (+) - epinephrine fails to interact with the PHE 289 or PHE 319 of the ligand a1A and P1- adrenoreceptor respectively. The chiral -OH group of the unnatural enantiomer may not sustain the interaction with the aspartate residue of these adrenoreceptors. This explains the low potency of the enantiomer. Oxymetazoline exhibited strong complimentary interactions of its imidazoline, phenyl and the OH group with the respective sites of the a1A adrenoreceptor. But the ligand had only aspartate interaction of the imidazoline with the p1- adrenoreceptor. The drug does not activate Pi- adrenoreceptor. Recently crystal structure of human Pi and p2 adrenoreceptors has been determined [42,43 ]. The third intracellular loop and part of the carboxyl terminal cytoplasmic tail is thought to interact with the G protein. These regions also contain many threonine and serine residues, which are phosphorylation sites believed to be important for receptor desensitization. G proteins, which provide the link between the activated receptor and the effector systems within the cell, are composed of three subunits termed a, p and y [44-46]. p and y subunits are hydrophobic and are associated with cell membrane, while the a subunit interacts with the receptor and the effector systems. In addition, guanine nucleotides bind to the a subunit. G proteins exist in inactive and active forms. In the inactive form, the a subunit binds GDP. When the agonist binds to the receptor, change in receptor conformation allows it to interact with the a subunit of the G protein. This interaction decreases the affinity of the a subunit for GDP and increases its affinity for GTP; consequently, GTP displaces GDP from the a subunit. The binding of GTP causes a subunit to dissociate from the p, y subunit of the G protein complex. The a subunit-GTP complex can then move within the membrane and bind to enzymes or ion channels, which in turn mediate the biological response. Figure 2. Potential interacting sites at a1A and p1- adrenoreceptors for (-)- Epinephrine from Patil et al. . Images reproduced with permission from Wiley InterScience. In the case of the Gs protein that stimulates the adenylyl cyclase system, the a subunit with GTP attached activates adenylyl cyclase, which can then catalyze the formation of cAMP from ATP . As long as GTP remains attached to the a subunit, this will be in the active form, and will continue to activate adenylyl cyclase. Adenylyl cyclase activation will be terminated when the attached GTP on the as molecule is hydrolyzed to GDP by a GTPase which is part of the a subunit. The as subunit then becomes inactive and will recombine with the p,y subunit reforming the trimeric G complex. The slow rate of hydrolysis of GTP bound to the as subunit may cause a relatively prolonged activation of adenylate cyclase relative to the duration of receptor activation, and this may serve to amplify the effector response to receptor activation. Receptors linked to G proteins also regulate other second messenger systems besides adenylate cyclase . The activity of the enzyme phospholipase C, which mediates intracellular phosphorylation reactions and the release of Ca2+ from intracellular stores, can be increased by agonists of a1-adrenergic receptors, H1 histamine receptors, 5-HT1 serotonergic receptors, and muscarinic receptors. This receptor mediated enzyme activation is regulated by G proteins. Phospholipase C is an enzyme bound to the cell membrane [48,49]. It catalyzes the hydrolysis of phosphatidylinositol-4,5-bisphosphate in the cell membrane, resulting in the formation of inositol-1,4,5-triphosphate and diacylglycerol. Inositol-1, 4,5-triphosphate is a water soluble compound that can bind to a receptor located on the membrane of the endoplasmic reticulum, which stores Ca2+ ions. Activation of this receptor causes the intracellular release of Ca2+ ions into the cytosol, where they can diffuse and activate a variety of enzymes, such as Ca2+ calmodulin-dependent protein kinases and protein kinase C. Resultant phosphorylation reactions are believed to be essential to many types of cellular responses. Diacylglycerol, is very lipophilic and consequently will accumulate in the cell membrane, where it can bind to and increase protein kinase C activity. Protein kinase C can then catalyzes phosphorylation of several proteins, such as those associated with muscle contractions, ion channels, receptors, or transport processes, producing biological effects. Inositol-l,4,5-trisphosphate and diacylglycerol are cycled back to reform phosphatidyl inositol-4,5-bisphosphate. As indicated above, ion channels can also be regulated by G proteins . In this case, receptor activation by drugs and neurotransmitters causes the activation of G proteins which in turn activates ion channels that regulate ion conductance through the cell membrane. Second messenger systems such as cyclic AMP or phosphatidyl inositol-4,5-bisphosphate are not generally required for ion channel activation. Both calcium and potassium ion channels have been implicated in this type of reaction. For example, it has been shown in patch clamp experiments using cardiac cells that the activation of muscarinic receptors increases potassium conductance, which was inhibited by pertussis toxin. This indicates that a Gi protein is involved in producing this response.